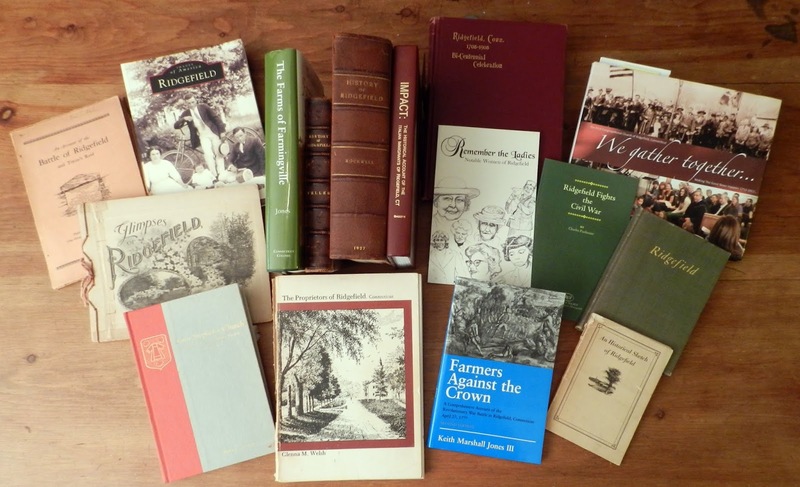 Here is an alphabetical list of more than two dozen, non-fiction books that have been published about Ridgefield, mostly from a historical point of view. Many of these titles are available at the Ridgefield Historical Society, including some out-of-print editions. Books on the Common has most in-print titles. Amazon can supply almost all of them. For used or reprint editions, check abe.com or amazon.com. Amazon offers many print-on-demand reprints of books that are considered “out of print.” Many of these titles are also available in electronic versions for Kindle, etc. — some older ones free of charge; try Googling the title. Some, like Rockwell’s history, can be read online. A comprehensive, lavishly illustrated report on many facets of Ridgefield, including architecture, neighborhoods, history, landmarks, natural resources, cultural and religious centers, open spaces, cemeteries, and more; produced in 2002 by the Ridgefield Design Council, soft-cover, extensive index. First detailed history of the 1777 battle, published on the 150th anniversary; by James R. Case, 56 pages, with map; privately printed, 1927; later reprints were done. The Barbour Collection of Connecticut Town Records, Volume 36 in a statewide series, reproduces the valuable Barbour index to Ridgefield births, marriages and deaths from 1709 to 1850. 167 pages devoted to Ridgefield. A must for any serious Ridgefield researcher. Also includes Redding vitals. Published in 2000 by Genealogical Publishing Company. Published by the Village Improvement Society in 1906, this 60-page small-form book contains many photographs of the town, its houses, gardens and points of interest, all taken by Joseph Hartmann. It includes a brief history of the town and of the society. Out of print, but available. Keith Marshall Jones wrote this comprehensive account of the Battle of Ridgefield during the Revolutionary War, revealing much new information and correcting many old mistakes in previous accounts. “This telling will remain the standard account of the battle for a long, long time,” said Christopher Collier, former Connecticut state historian.162 pages, paperback, extensively illustrated. Published 2002. Out of print. While Keith Marshall Jones calls this book "a two-century history of 23 Ridgefield, Connecticut farmhouses and the people who gave them life," it is really a history of a good part of the town. He has extensively researched a section on Ridgefield that contains a significant cross-section of the community from the 1700s into the 20th Century, and gives a picture of what life here was like during that period. Published 2001. Hardcover. 509 pages, indexed. Many maps, house plans, photos. Available at Ridgefield Historical Society. 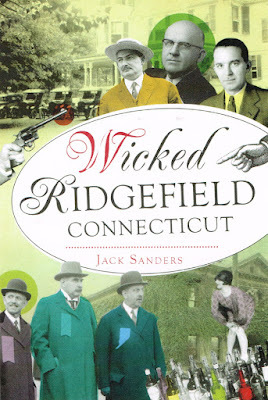 Self-guided tours of Ridgefield village history, with more than 50 pictures from the past, by Jack Sanders. 56 pages, indexed, map. Last updated in 2008. $5 price benefits Ridgefield Historical Society. An unnumbered, album-style book of dozens pictures of Ridgefield from the 1890s by a pioneering woman photographer in Connecticut, Marie H. Kendall. Copies rarely appear on the market. Published in 1900. A look at Ridgefield’s often unheralded people, places and things, a sort of sequel to Ridgefield Chronicles, relating little-known pieces of what make Ridgefield a remarkable place in which to live, work, visit—or write history; by Jack Sanders. 160 pages. Dozens of pictures and maps. Published in 2015 by The History Press. While small of size and only 48 pages, this well-done paperbound book, published around 1920, contains a history of the town and a description of what it was like a century ago, made all the more remarkable by the fact that it was written by Allen Nevins, who went on to win two Pulitzer Prizes for history writing. Published by The Elms Inn. Out of print. George L. Rockwell's 583-page classic has been long out of print, but copies become available. Particularly strong on 19th and early 20th Century history, and containing many early birth, marriage and death records. The book has many photos taken by Joseph Hartmann. Cloth and leather editions were printed. Also, in the 1980s, a reprinted edition was published. Out of print. In 1878, the Rev. Daniel Teller of the First Congregational Church published this 251-page book, the first comprehensive history of the town. While much of the content is covered in later histories, the engravings of various Ridgefield buildings and scenes, all based on very early photographs, are both wonderful and valuable. Not indexed. Published in cloth and leather versions. Out of print. 127 pages of finely reproduced pictures of Ridgefield past, published in 1999. People, houses, businesses, scenes of town life, etc. from 1890s to 1950s, produced by Ridgefield Archives Committee, now the Ridgefield Historical Society. Arcadia Publishing. Extensive history of Italian community of Ridgefield, with many biographies, photos, and interviews; by Aldo Biagiotti; 345 pages, indexed; privately printed, 1990. An 88-page, tabloid-newspaper-sized collection of brief biographies of more than 400 people who made news in Ridgefield during the 20th Century, published by The Ridgefield Press on its 125th anniversary. Also contains extensive timeline. Illustrated, indexed. Published in 2000. Available from The Ridgefield Press, 16 Bailey Avenue. Glenna M. Welsh's history tells of the early settlement of the town, with particular focus on those who lived on Main Street. Not indexed. Many illustrations. Published in 1976 in paper and cloth editions, the clothbound version is still available at the Keeler Tavern or from the Ridgefield Historical Society. 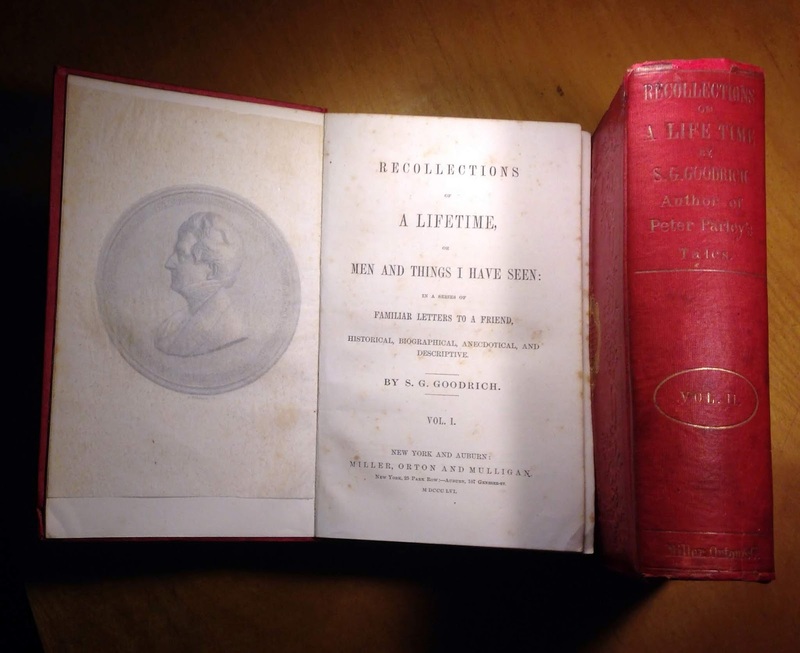 This is the two-volume autobiography of Samuel G. Goodrich, who wrote more than 100 books, mostly for young people, under the name of Peter Parley. The first 300 or so pages are devoted to his growing up in Ridgefield in the late 1700s and early 1800s and provide a fascinating and rare look at life in the town two centuries ago. Published in 1856 by Miller, Orton and Mulligan. 1,100+ pages, many illustrations, indexed. Used copies available but often damaged and expensive; available in reprint — some reprint publishers will sell only volume one, containing the Ridgefield information, but no index, which is in volume two (note that an abridged edition was also published in 1800s; this should be avoided by anyone wanting his complete account of Ridgefield). Profiles of 14 noteworthy women in Ridgefield’s history; also covers organizations they founded or led; 100 pages, illustrated, published by Ridgefield Historical Society, 2008. More than 215 views of what Ridgefield looked like during the first half of the 20th Century. Postcard images of homes, estates, inns, street scenes, stores, churches, and more. Over 20,000 words of accompanying history and lore about the locales pictured, by Jack Sanders. 126 pages, bibliography and index. Arcadia Publishing, 2003. Lavishly illustrated, coffee-table book about the town’s celebration of its 300th birthday in 2008, produced by Ridgefield Magazine. Offers glimpses into aspects of Ridgefield’s history including interesting people, the things they accomplished, and the way they lived, as well as the town’s varied geography and place names, by Jack Sanders. More than 60 pictures. 160 pages.The History Press, 2014. Collection of history, recollections, speeches, and photographs in connection with the town’s 200th birthday celebration. 96 pages, hardbound. Published by the Bi-Centennial Committee, 1908. Out of print. Published in 1958, the most modern complete history of the town, with many illustrations, old maps, and military records; written by Smithsonian Institution historian Silvio A. Bedini. 396 pages, indexed. Out of print. Written by Robert S. Haight, this book tells the story of the church and its place in the community. 220 pages, indexed and illustrated, published 1975. A supplement by Dirk Bollenback, Saint Stephen's Church Reaches the Millennium, 114 pages, indexed and illustrated, covers 1975 to 2000. Sold by the church, 351 Main Street. This is an extensively illustrated survey history of the First Congregational Church, by its then pastor, the Rev. Charles Hambrick-Stowe. 68 pages. 2011. This 26-page, large format booklet was published in 1950 by the League of Women Voters and suggested possibilities for Ridgefield’s dealing with future growth, including bypasses for the village, and complete reconstruction of commercial blocks in the village. A historical assortment of bad guys and bad times including thievery, bigotry, murders, missing persons, arson, book-banning, and other assorted man-made misery. “This look at the darker side of Ridgefield history points out some heroes, offers some lessons, and provides even a little humor,” says author Jack Sanders in introduction. 160 pages, many pictures, indexed. The History Press, 2016.